The USB Component enables you to create USB Device and USB Host applications and is part of . The USB Protocol is handled by the USB Component, so that developers can focus on their application needs. USB Host (MDK-Professional only) is used to communicate to other USB Device peripherals over the USB bus. USB Device implements a device peripheral that can be connected to an USB Host. 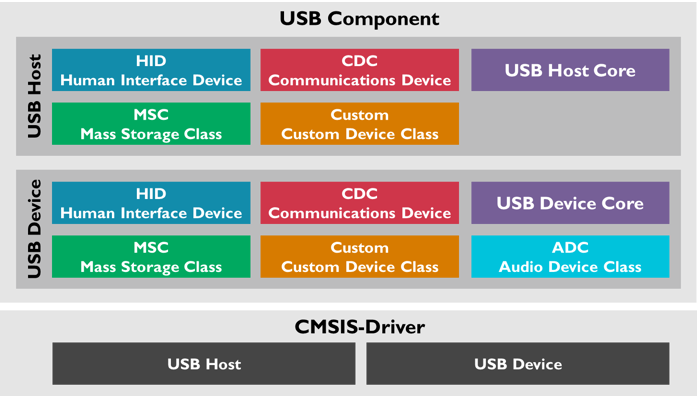 Composite USB Devices supporting multiple device classes can be implemented. for USB Host and USB Device provide the interface to the microcontroller peripherals. USB Device explains how to implement a USB Device with a microcontroller. USB Host (MDK-Professional only) explains how to implement a USB Host with a microcontroller (MDK-Professional only). USB Concepts contains general information about USB. Supported USB Classes provides details about the supported USB Device Classes. Function Overview lists the complete API of the USB Component. Resource Requirements shows the configuration of system resources for USB in detail. The USB-IF Developers Area contains the complete USB 2.0 Specification and additional information that is referenced in this user's guide. Generated on Tue Nov 13 2018 11:07:47 for USB Component by ARM Ltd. All rights reserved.